Born in 1976, lives and works in Cairo and Bern. Omar Ghayatt was born in Cairo in 1976. He did his Bachelor degree at the faculty of Arts and Education in Cairo in 1998. In 2003 he founded the Theater Company “Studio Moroni” and presented his first major art work, “Night Traveller”, at Townhouse Gallery in Cairo. He won the first prize for performance art at the 15th Egyptian Youth Salon in the same year – the first prize ever awarded in Egypt for performance art. 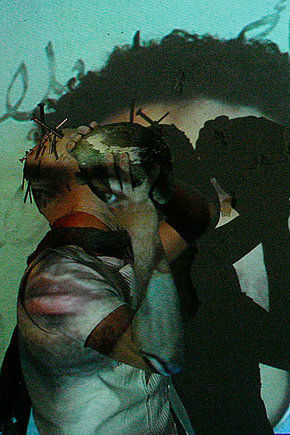 In the following years, Ghayatts work took him to various countries, including France, Bosnia, Turkey, Poland and Korea. In 2007, he came to Bern with the Pro Helvetia Artist in Residence program. He has since then returned to Switzerland to do a Masters degree in Scenography at the Zurich University of the Arts (Zürcher Hochschule der Künste). Since 2010, he is based in Stadtgalerie Bern, with a sponsored Studio from the City of Bern, besides still being an associated artist of Townhouse Gallery Cairo. Omar Ghayatt early interest in drama, combined with a strong sense for the visual, led him to develop his own characteristic blend of performance art. Early performances circle around the themes of birth, death, and the human existence. More recently, Ghayatt has focused on the tensions we are presented with in a globalized world, exploring the much discussed “culture clash” between the West and the Orient in his collaboration “Made in Paradise” with performance artist Yan Duyvendak and dramaturge Nicole Borgeat. His newest project, “If I Weren’t Egyptian, …” is a play on the border of fiction and reality, centered around the universal human tendency to project hopes and dreams on an Elsewhere. Ghayatts work aims at exploring the universal through the specific, employing a clear, visual language of images, scenes and movements that can be globally understood. You can also visit Omar Ghayatt's website for more ample information. Omar Ghayatt. Egypt. (detail) © Mariusz Marchewa Marchiewicz.